Hard to believe that Christmas was two and a half weeks ago and that was the last time I posted an entry here. I have been reading others’ blogs and meaning to post my own but have been busy. Felix suggested yesterday that we would get away from the house today. What he had in mind didn’t work out since he needed to go to Miragone to buy propagne gas tanks for the clinic and get some work done on the clinic truck. So, since I’m here, I’ll “get away” through xanga-land. Our vacation to the PAP area went very well. We were supposed to go to an OMS guest house (Ormiso) fron 12/28 – 1/7 but found out on the 23rd that a large group was coming from the US to do sports evangelization. 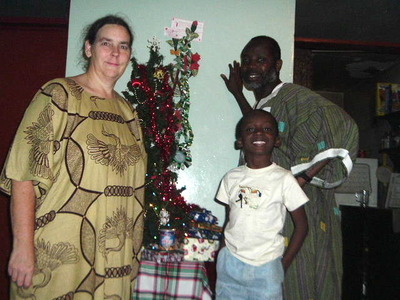 I contacted Ann, a lady that I met in October, and she said that we could stay in a house on their mission compound that is about 20 min north of PAP. It was wonderful! We had a modern house, well-equipped kitchen, electricity 24/7, and even a TV with DVD! The compound had a swimming pool which we used and Ann and Tim have kids that Matthew had a ball playing with. There was plenty of time to sleep, read, watch movies together and reconnect with God. We made a couple of trips out, visiting fellow officers, a staff member’s family, and the Baptist Mission in the mountains just east of PAP. The Baptist Mission even has a very small “zoo” so Matthew and I visited the animals (rabbits, crocadile, monkey, peacocks, parrots, guinea pigs, etc) while Felix stocked up on “Our Daily Bread” in French to give out to the staff and other business connections. 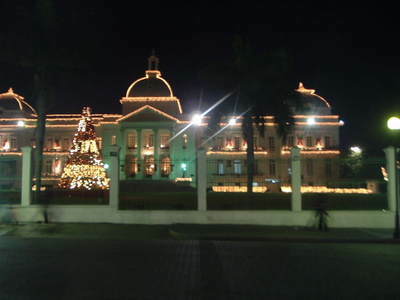 While in PAP, we got to enjoy the Christmas lights, and saw the ones at the Presidential Palace for the first time. It was lovely. The photo doesn’t quite do it justice. 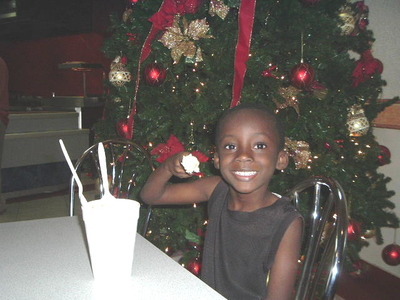 We also ate at a favorite fast food restaurant, starting out with ice cream since Matthew has been longing for it for months. Where we are, 3 hours outside of PAP, we just can’t bring it back and we rarely take Matthew with us to PAP. So here is his very happy face. 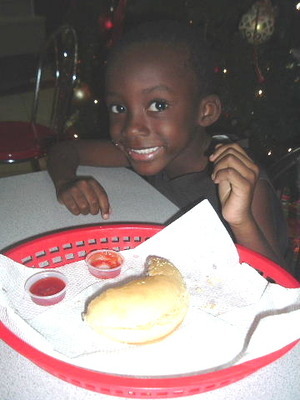 We also had hamburgers and french fries and Matthew’s hamburger’s smile is just about as big as Matthew’s! We’ve enjoyed getting cards from our friends in the states. I staple them to ribbons on the door so that it can become part of our decorations. After the season, we save them and pray for our friends throughout the year. 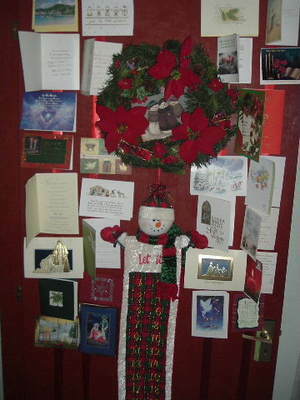 Thanks for your cards and greetings. I love the photo cards and just wish that someone had invented a special photo album the size of christmas photo cards. It would be a great way to see the progression from year to year. We have gotten back into the swing of things at the clinic. Matthew will start after school lessons on Monday (one hour extra with his teacher). Maybe the extra attention will help him grasp the reading concepts and reach his potential. He’s a smart little guy but not really interested in sitting still and listening and following directions. Would rather play and watch DVD’s. After all, he’s only five! I’ve found a site on the internet for reading readiness in English and he really enjoys that. Wonder if they have one in French? Great pics. Glad you got some time away and as a family. Glad you got our card – and I do see it on your picture. All smiles here! But not nearly as big and nice as Matthews. Seeing his smile just brightens my whole day! RYC: Commissioning sounds great! MSI sounds fun, too. Let’s plan it! Thank you for your prayers on my behalf..yes I did survive the holidays! I’ll post before my surgery .Meanwhile, may God bless you as you serve Him in Haiti! Great pics! Thanks for sharing them! Matthew is just too cute!! GLad you got to get away! Blessings to you! !